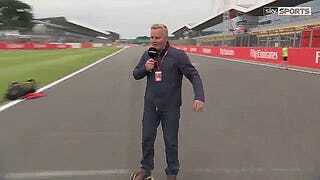 Please enjoy this clip of 24 Hours of Le Mans winner, ex-Formula One driver and Sky Sports F1 commentator Johnny Herbert eating it on a hoverboard. There we have it: conclusive proof that these things are harder to drive/ride/steer/whatever it is that you do on these than a Formula One car, the Le Mans-winning Mazda 787B, or any number of racing vehicles Herbert has had an easier time figuring out. Oh, and they still don’t actually hover. Come back when we have a real, off-the-ground, Back to the Future-style hoverboard that Johnny Herbert can also fall off of for our amusement.